Richard is right, and not for the first time: if the British left was serious about the message of “Arm the Kurds”, then it would be the wrong slogan. It would concede to our rulers or to the Turkish state a right to intervene, when there have been too many interventions already. ISIS is the child of the broken promises made by the US to the Anbar Awakening Council at the time of AQI’s defeat in 2006-7. The best sign that a US presence will not help is the evident glee with which Isis is begging for troops to be sent. Their films make this clear; made for a Western audience, they promise an infinite succession of high profile casualties, each one making our leaders look worse, with only one solution – the killings will stop, if only the troops are sent. Isis well understands that nothing would do more to bolster its status in the Arab world than if it were to find itself toe-to-toe with American forces in Iraq and Syria. And yet, if the alternative to “Arm the Kurds” is “Don’t Bomb Iraq”, then this slogan is actually worse. It plays to a story about the left in which we never directly promote workers’ struggles, women’s rights, but always proceed sideways, crab-like, thinking to ourselves, “Who are the Americans supporting? We must, by definition, be against them.” The Kurdish militia fighting in Kobane are not hardened PKK veterans drawing on a 20-year history of struggle with the Turkish state. They are hastily assembled militia, comprising women in equal numbers and authority to men, brought together by a loose identification with a Kurdish nationalist politics that is infused with elements of secularism and socialism. They have not chosen to take up arms and do not glorify violence. Save for the choice that has been forced upon them – resist or be killed – they are in no essential way different from the local committees that we saw in Egypt during the Arab spring defending towns from Mubarak’s attempted counter-revolution. Ranged against them is a campaign which makes a glorification of death. There have of course been people before who used violence, including killing, as a form of propaganda. But the anarchists of pre-1914 France blew up politicians or bosses, not aid workers. It was the same – in all essentials – in Ireland, in Vietnam, and Sri Lanka. The left has no obligation to indulge or prettify ISIS. We know that among those volunteering to fight in Iraq and Syria are hundreds of people from Britain and the US. Sometimes, a mere fluke of happenstance distinguishes the people who decided to join the left on anti-war demos from those who have taken a different, worse path. And so we have a responsibility, while opposing our own rulers and the US, also to repeat certain basic messages – that a society which glorifies in the subjugation of women is a society in which far more than half of the people are going to be unfree. Richard is right, we cannot say “arm the Kurds”, but we can say that – politically, morally, with all the limited solidarity we can legitimately give – we are with the people of Kobane now. Dave – You and Richard make some very good points about the illusions people may have about ALL the different parties in the Iraq/Syria civil war. But I have a nagging feeling that you both leave an unanswered question. 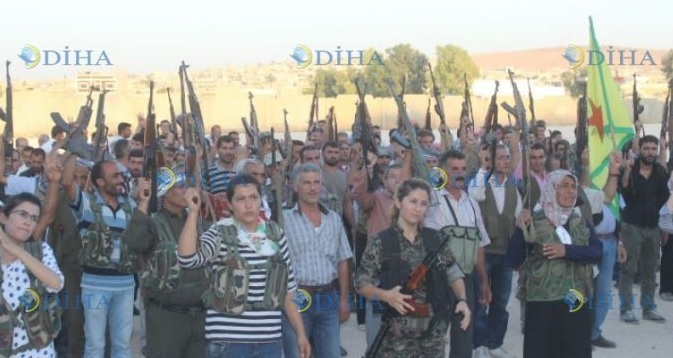 Do the Kurds have the right to demand arms to defend their people against Daesh – even of imperial powers? Did the Irish Volunteers have the right to seek arms from the Kaiser’s German imperial Germany before 1916? If they did should German socialists have opposed any transfer of arms to the IV?